I know I know, another dal recipe, but there are so many ways to make dal! 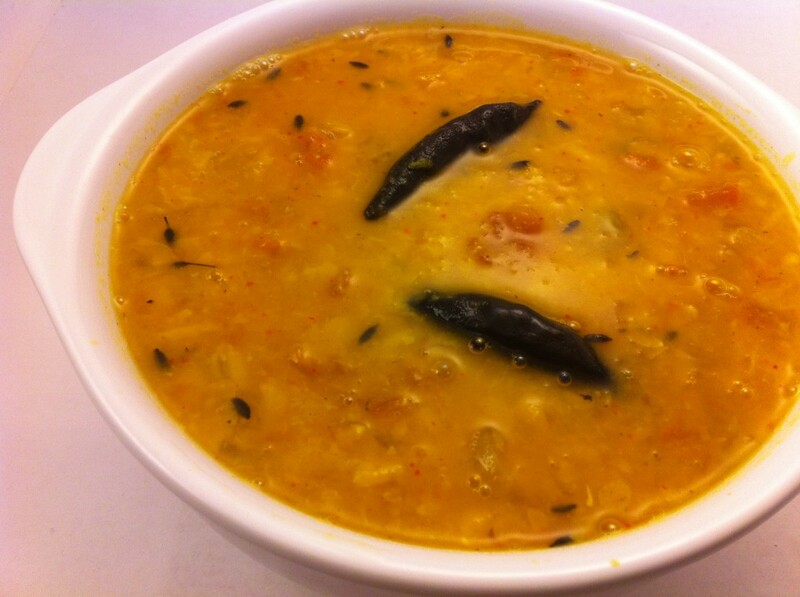 This is a simple tadka dal using toor dal. Tadka just means frying spices in oil or butter/ghee. In this recipe, I cooked the onions, garlic, ginger and tomatoes in the pressure cooker with the dal and then made a tadka of cumin seeds and dried red chilis. I think of this dal as more North Indian since I didn’t use mustard seeds or curry leaves. You could also cook the dal separately in the pressure cooker and then cook the rest separately and add the dal later. I find this way to be a little faster. I like this dal best with rice, yogurt and tangy tomato pickle. Heat oil in a pressure cooker then saute the onions until they start to get translucent, adding the garlic, ginger, and chilis part way through cooking. You don’t need to cook them too long, just a little. Add the tomatoes, turmeric, dal and water to 1/4 – 1/3 the way up the cooker. Heat over high until the first whistle, turn to medium and cook for about 8 minutes. Heat the rest of the oil in a tadka or other small pan and cook the cumin seeds and red chilis until browned. Add the cumin and red chilis and salt to the dal.